Exterior landscaped areas, access for people with reduced mobility and safe indoor platforms. 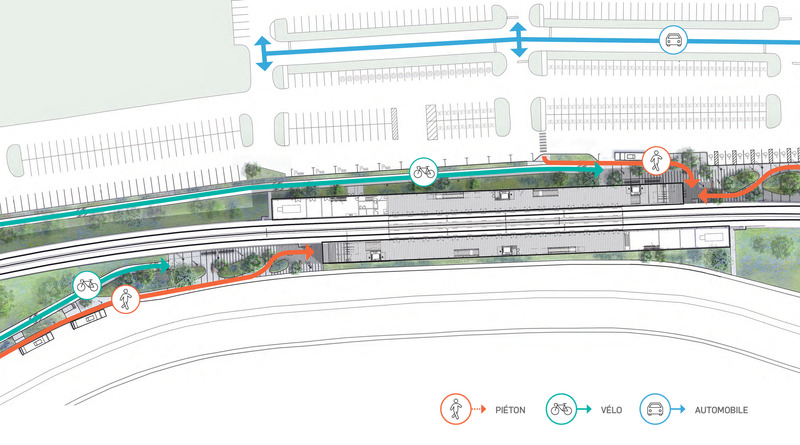 The Du Ruisseau station in the Saint-Laurent borough offers a glimpse of the REM’s future stations. There's more to architecture than meets the eye! The REM’s architects (Lemay, Perkins+Will, Bisson Fortin et Provencher_Roy) have also designed outdoor landscaping to create pleasant areas. For example, station entrances have been designed as public spaces for meeting up before entering the metro or when exiting. Many of the areas will be landscaped and will feature urban furniture and works of art to create a high-quality environment for local residents and public transit users. The stations are designed to accommodate all access methods: pedestrians, cyclists, buses, carpooling and car sharing (see diagram above). Pedestrian accesses are designed to minimize intersecting with cyclists and vehicles, to ensure free-flowing traffic and greater safety. Bicycle racks and even some Bixi docking stations will also be available. Horizontal and vertical slats: on the exterior – they evoke the metro’s movement and the scenery rolling past. Glass: to provide natural light and a sense of security for users. Wood: on the ceiling – this is a nod to the historic use of this material in Québec construction. Wood provides warmth to modern buildings and reduces the ecological footprint. The Du Ruisseau station is a standard model of a ground-level station (of the REM’s 26 stations, 5 are underground, 9 are elevated and 12 are ground-level). This means that the principles of this model will be used in several other stations, notably throughout the Deux-Montagnes Branch. The architecture of the Du Ruisseau station will resemble that of 6 other stations: Canora, Montpellier, Bois-Franc, Île-Bigras and Grand-Moulin. In each case, specific attention will also be paid to the station’s integration into the community. Inside, the REM will operate the same way as the Montréal metro: users will access the platform through ticket gates, using a ticket. Note that fares in the Greater Montréal area (for the metro, bus, and commuter trains) are set by a public institution, the Autorité régionale de transport métropolitain (ARTM). As such, we do not decide the ticket prices but, realistically, the rates should be comparable to the fare zone system. All stations will be accessible to persons with reduced mobility and will be equipped with elevators. These elevators will also be handy for families with strollers and for travellers headed to the airport with suitcases. On the platforms, one of the differences with the South Shore terminal and the stations on the Deux-Montagnes train line (that the REM is replacing) is that the stations will be covered. Users will wait for the REM in an area sheltered against the cold of winter and ventilated in summer. Final specific feature: the platforms are secured by screen doors (see photo below), a system more commonly found in Europe and Asia. In addition to increased passenger safety, these screen doors prevent objects from being dropped onto the tracks—one of the main causes for delays in the Montréal metro! This feature guarantees reliable service for your commutes.